These beautiful Botleys Mansion wedding photos from this amazing fairytale wedding at Botleys Mansion, would not fail to lift anyone’s mood whatever the weather outside. For Leanna and Luke’s wedding luckily the sun was shining anyway making this an even more memorable day. The theme for this Botleys Mansion wedding was opulence, crystals and the softest pale lemon that the Sorento inspired wedding could conjure. Complete with tempting mini Limoncello bottles as favours, this wedding was a dream to arrange from start to finish. Leanna and Luke held their wedding ceremony at the beautiful Holy Trinity Church in Lyne and Longcross. 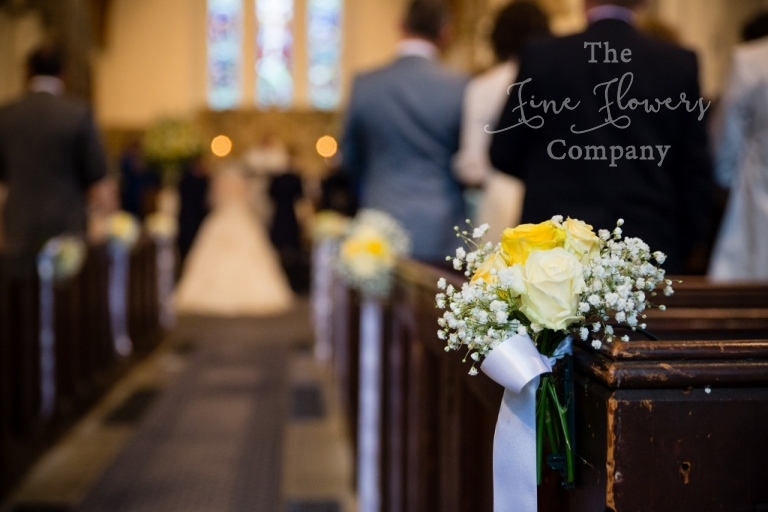 We dressed the church with pretty gypsophilla and roses pew end posies, and framed the ceremony with gorgeous urn displays of tall delphiniums, bloomy lemon garden tea-roses, ivory roses and hydrangeas and draping amaranthus catkins. 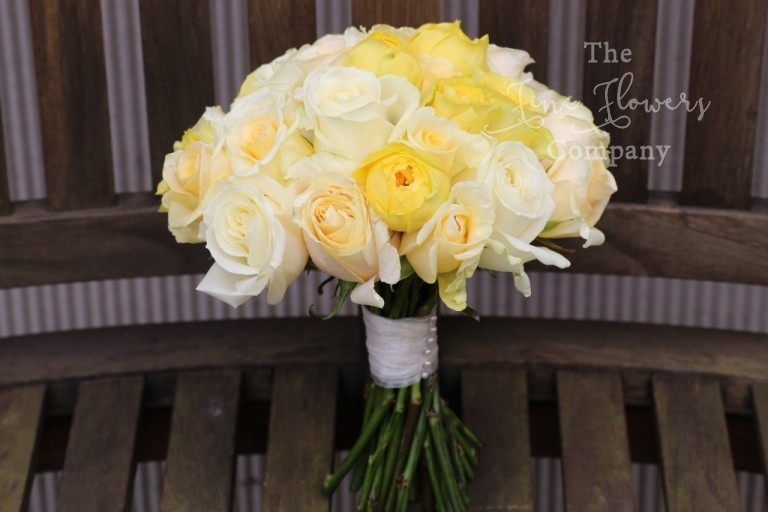 Leanna and her prettty bridesmaids carried gorgeous bouquets of Avalanche roses, yellow Catalina spray roses and Illios roses and lemon Creme de la Creme roses. The girls were picked up from Botleys Mansion and taken to the church in the most handsome horse drawn carriage I’ve ever seen, truely princess travel style. Back at Botleys Mansion the guests were welcome into the huge and airy atrium by beautiful bloomy and dreamy Martini vase centerpieces dripping with crystals to match the grand chandelliers in the room. We used a mix of hydrangeas, roses, dahlias and pretty gypsohilla for a really gorgous opulent look without any foliage, to keep it looking as light and fluffy as an Italian lemon sorbet. A matching set of crystal adorned low vase centrepieces were lined up along the oval top table and looked amazing. The head table was framed by two grand urn displays matching those at the church, and the grand staircase was dressed with more rose and gypsophilla clusters. The whole atrium was bathed in light and made this beautiful soft colour scheme look amazingly romantic in these gorgeous Botleys Mansion wedding photos. The pretty sweets cart, vintage popcorn machine, chocolate fountain and the all important Limoncello favours completed the array of guests treats for this stunning and unique wedding. If you are planning your wedding flowers for Botleys Mansion, please visit our dedicated Botleys Mansion wedding photos home page to access more featured real weddings Botleys Mansion wedding photos, to get more ideas for your wedding flowers at Botleys. Or for broader ideas in many more styles and colour schemes, please visit our general gallery pages. We are very local to Botleys and would be delighted to advise you. In the meantime, I hope you like all the Botleys Mansion wedding photos below, from this really beautiful wedding.